1. Chicago: Most of Illinois’ 23 interstate highways are traversed by 60% commercial trucking. It is a mid-way point for much transcontinental traffic with a hotbed of solid highway infrastructure and the BELT railways system, the largest intermediate switching terminal in the US. It’s a no brainer that Chicago ranked first. 2. California: As the most populous state in the US with strong and busy port cities of Los Angeles and Long Beach, large metropolitan cities and many airports providing extensive air cargo support, California is a continued favorite for logistics services. 3. Texas: Leave out Texas’ proximity to Mexico and focus on its population and ports and you’ll see why Texas pulls in position 3. WIth Houston, a lofty 6 million strong and the 2nd busiest port for ocean freight, and Dallas as the 8th most populated city with both strong rail and transportation, it’s easy to see how adding trade to Mexico keeps Texas high on the list. 4. Georgia: Atlanta continues to bring much traffic through the state with three major interstate systems transecting its borders. At 5 million strong, it serves position nine as most populated metropolitan city. 5. Florida: With the expansion of the Panama Canal, it’s easy to see why Florida will remain in the top five for logistics markets moving forward. 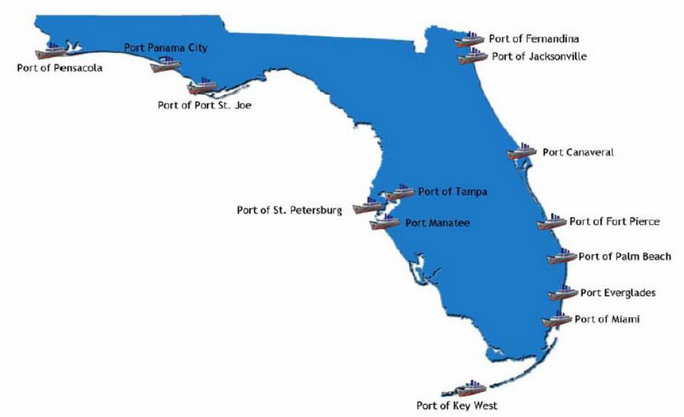 With 15 public ports and a surprising 9% of Florida’s GDP coming from cargo, we see this as a welcoming hub for future trade both from Asia and Europe, but increasingly from Central and South America.